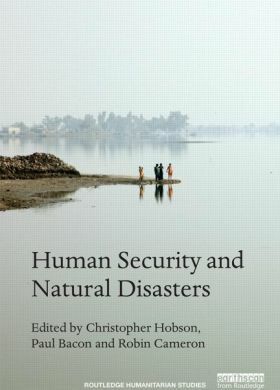 A new book co-edited by UNU-IAS Visiting Research Fellow Christopher Hobson explores the impacts of natural disasters on people, presenting a variety of case studies that include the Indian Ocean tsunami, Hurricane Katrina, the 2010 Haiti earthquake, and the 2011 “triple disaster” in Japan. Human Security and Natural Disasters further develops the interdisciplinary dimension of the human security approach by bringing together a diverse range of experts to consider issues related to development, gender, ethics, public health, law and governance. The book takes a unique approach by applying the concept of human security, which emphasizes the security of individuals rather than of states. Human security is concerned with the emergencies that affect people every day, such as famine, disease, displacement, civil conflict and environmental degradation. To date, there has been a strong tendency to focus on insecurity caused by civil conflict, with less attention on issues to do with environmental security. The book specifically addresses natural disasters, which represent a growing human security threat to people everywhere. It unpacks the human element of natural disasters, looking at how pre-existing vulnerabilities can be gravely worsened, as well as the interconnected nature of human security threats. Published 20 years after the human security approach was first announced in the UNDP Human Development Report 1994, the book provides an important reassessment of the human security approach, demonstrating how it still has considerable relevance. Dr. Matthias C. Kettemann (University of Graz, Austria) observed that “at a time when the UN has committed to mainstreaming human security across its policies, this book provides essential insights into how human security can help deal with natural disasters”. The book is the first of two resulting from a UNU Institute for Sustainability and Peace project (UNU-ISP; now part of UNU-IAS). The project Human Security and Natural Disasters was launched after the “triple disaster” of March 2011. It placed the Japanese experience in comparative context, by exploring it in relation to a range of other major catastrophes, and focusing on the dynamic between the immediate event and the deeper societal structures that shape human vulnerability and possibility. With funding from the Japan Foundation, UNU-ISP organized a series of academic workshops and public events on these issues. The second book, Human Security and Japan’s Triple Disaster, will be published in June, bringing together contributions from leading Japanese and international scholars to reflect on the consequences of the March 2011 disasters. This work has also served as the foundation for a new UNU-IAS project, the Fukushima Global Communication Programme, which applies the human security approach specifically to the nuclear accident at the Fukushima Daiichi power plant. The first two chapters of the book are available to read free online until 15 May 2014.